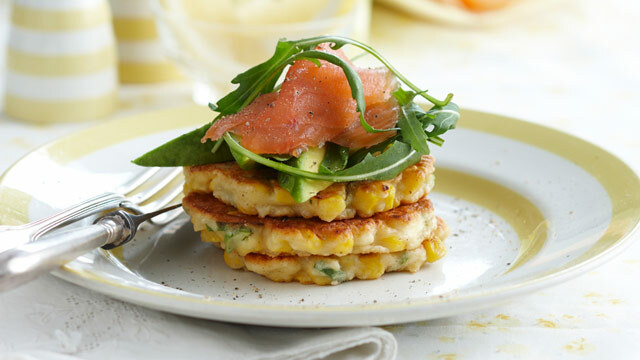 The corn in this dish is high in arginine, which boosts sperm count and motility, while the salmon helps boost male fertility. Place half the corn kernels, spring onion, eggs, coriander, flour, salt and pepper in a food processor and process for about 10-15 seconds until combined. Place in a large bowl. Using your hands, squeeze the zucchini to remove any excess moisture. Add to the corn mixture along with the remaining corn kernels. Stir to combine. Heat 1-2 tablespoons of the oil in a non-stick frying pan over a medium heat. Drop large spoonfuls of the mixture into the pan and cook for 2-3 minutes until golden on the underside. Turn and cook the other side until golden and cooked through. Repeat with remaining mixture, using more oil if needed. Fresh tip: These also make a great lunch for the whole family.